One of the best things I did this year was show up at the Progressive's BBQ on the hill that was graciously hosted by Senator Elaine McCoy of Calgary, Alberta. What made it a great learning experience for me was that the people at the meet-up were far more experienced at blogging than me and old hands at watching the Liberal Party. I , for example, held out great hope that Iggy had learned a lot in is summer excursions across the country and would return better prepared to lead a political party than he had been in the past. He has always struck me as someone who should be the guy behind the guy and not the guy. Better suited to being a policy wonk than a party leader is what I'm trying to say, and still I held out hope. My fellow bloggers however, not so much. In fact they were downright pessimistic about how Iggy was going to perform in the upcoming fall session of Parliament. Surely, I thought to myself, they were just a bit overly cynical. There was no reason to believe he wouldn't come back having listened to what it is that concerns Canadians most and better understand what issues we would like him to stand up for on our behalf. Certainly there was no reason to believe that he wouldn't get better at messaging and keeping Canadians aware of what it was the sneaky bill stuffing Tories were doing. Sadly, the bloggers skepticism about how Iggy would perform has proved to be spot on. The latest example of Michael Ignatieff failing to stand up for principle and not communicating to Canadians what the issue at stake was is the recent failure of bill C-300. For some reason this 18 month old bill that had been called a "a critical first step," by Graham Denyer Willis, Executive Director of the Canadian Centre for the Study of Resource Conflict, has been allowed to die by a vote of 140-134 with 14 Liberal members including Iggy himself abstaining from the vote. The bill would have created a set of new regulations that would safeguard remote and globally excluded communities from major abuses. Needless too say the mining industry was against it and lobbied heavily for its defeat. Even more unsurprisingly they found willing accomplices to defeat this measure in the Conservative Party who once again easily bullied Iggy into backing off. They invoked the "coalition" monster again, which on its face seems ridiculous, and predictably talked about the lost jobs that would follow passage of this bill which is what corporations always threaten when faced with legislation or regulations they don't like. To the confusion and consternation of members of his own party he backed off. Will Iggy ever stand up for principle over poll numbers? Is there no issue important enough for him to stand up and take a chance. Has he just once on any issue drawn a line in the sand and said this is where I stand? The answer to this rhetorical line of questioning, apparently, is no. Strangely after the defeat of this bill the Liberals sent out a news release that said, “Despite the defeat of C-300, the Liberal Party remains committed to the important principle of corporate social responsibility for Canadian industries at home and abroad." That's is moronic. You don't defend social responsibility by losing when you had the votes to win. As Amnesty International points out it is another black mark on Canada's reputation and Ignatieff deserves full measure of the blame for cowardly behaviour. When the going got a bit tough, brave, brave Sir Iggy bravely ran away. Small wonder then that his poll numbers simply never get any better. Ignatieff performs well when he appears strong and decisive. The Liberal Party poll numbers go up when he asserts his leadership. The Liberal poll numbers go down when he ends up being wishy-washy. It's not good enough to have several MPs abstain if the Liberal Party believes in a course of action. To have several MPs abstaining is equivalent to the Liberals supporting the Conservatives. Somehow, I get the feeling that the Liberal brass supported Ignatieff because he was the not-Bob Rae candidate. The brass didn't want Rae as the leader so they found not-Rae in Ignatieff. The Liberals had better hope for a draw in the next election. Even if Iggy squeaked through with a Minority gov't, the Cons and probably the rest of Canada would work really hard at making sure he was a One Term Gyu, like the Repugs/Teapartiers are doing in the U.S. right now. So can we please skip that altogether and move on to new Leadership? ya, new leader I pick Karl,he's our man. The LPC lead by anyone since trudeau has been lost in the wilderness. Iggy is just another of the poor choices they have made. Iggy of course is only part of the LPC problem, the other problem is coming up with a vision. Hello Rick! I agree with you about their lack of vision and find it inexplicable. Better health care - less spending on prisons, fancy jets and tax cuts for corps -- while devoting the necessary resources to protect our environmennt and start moving towards clean energy programs. Easier said than done like a lot of political platforms I'll admit, but a place to start.. Skinny Dipper, I thought they picked Iggy 'cause he wasn't Stephane Dion - but I see your point - I like Rae myself. 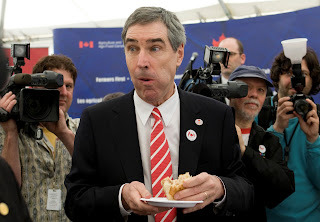 I heard Mardi Tindal last week describe Ignatieff as a man waiting to hear from Canadians that we'll support difficult choices from him concerning the environment. That was a delicate way of saying he's completely backward on environmental issues, because he's scared to stand up to the oil lobby.